Congratulations Festibérico! The 10th edition of Festibérico comes to an end. Once again we managed together to make this Spanish and Portuguese film festival possible. Above all we managed to keep the intimate atmosphere that makes it so special. So, congratulations everybody! Congratulations to our loyal audience who come to every appointment with curiosity and excitement, congratulations to the wonderful guests coming from Portugal and Spain to share their world and their work with us, congratulations to the sponsors who offer us their support, congratulations to filmhouse Lumen and to the organization of Festibérico who devote their time and effort to this unique event. 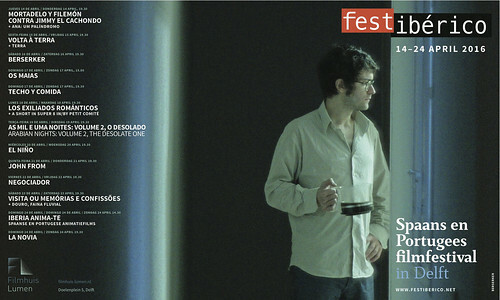 Congratulations, of course, to Spanish and Portuguese cinema for bringing us closer to other realities in these few days. The intention of Festibérico is still alive, that is portraying the Portuguese and the Spanish culture and showing them in the Netherlands. We hope to continue this labor for a long time, counting on the help from all of you.